"41UR315, Burial 32, Vessel 180" by Timothy K. Perttula and Robert Z. Selden Jr.
DECORATION (INCLUDING MOTIF AND ELEMENTS WHEN APPARENT): The rim is decorated with three smoothed horizontal neck bands. The body has horizontal to diagonal brushing marks. 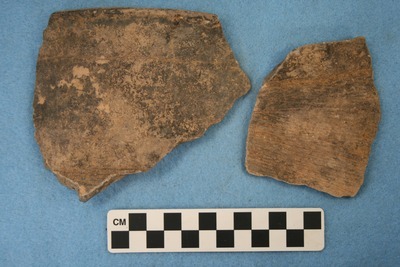 LaRue Neck Banded jar sherds, Vessel 180, Burial 32.